Passenger traffic at Dubai International Airport (DXB) exceeded 6.8 million in May this year, operator Dubai Airports has revealed. Total passenger numbers reached 6,850,052 compared to 6,721,995 in May 2016, representing a 1.9 percent year-on-year increase. During the first five months of 2017, DXB welcomed 36,969,594 passengers, up 6.7 percent compared to 34,649,748 passengers recorded during the same period last year. South America was the fastest growing region in May with passenger traffic rising by a significant 60 percent. Eastern Europe was the second biggest growth market (+15.5 percent) followed by Asia (+9.7 percent). In terms of passenger volumes, India topped the list, accounting for 1,029,929 passengers, followed by Saudi Arabia (508,613), the UK (451,540), and Pakistan (354,924), while the top cities for passenger traffic were London (292,193), Mumbai (216,173) and Jeddah (178,220). Flight movements hit the 34,544 mark in May, year-to-date flight numbers reached 175,155 and the average number of passengers per flight during the month was 205, up 1.5 percent compared to 202 in May last year. Freight volumes at DXB continued to grow steadily, reaching 232,884 tonnes compared to 226,916 tonnes in May 2016, an increase of 2.6 percent. During the first five months of 2017 cargo handled at DXB totalled 1,087,243 tonnes, up 3 percent compared to 1,055,850 tonnes handled during the same period last year. 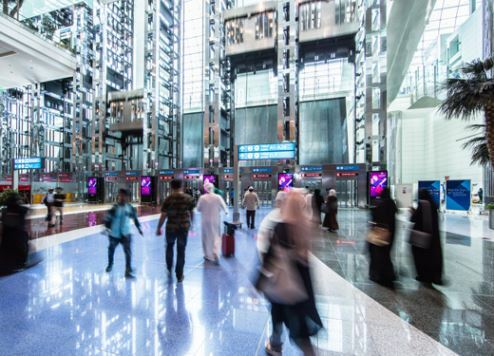 “Considering that we’ve had some record breaking months earlier in the year, including the rush of travellers during the summer holiday and Eid break last week, we are looking forward to robust growth in the first half,” said Dubai Airports CEO Paul Griffiths.